Crocs HUARACHE FLIP women's Flip flops / Sandals (Shoes) in Black Synthetic, Available in women's sizes. 3,4,5,8. Free Next Day Delivery and Free Returns on all orders! The classic croc silhouette loses nothing in its miniaturisation. Your little one can slip them on and off with ease giving them all the time in the world for that busy lifestyle of theirs. Constructed from man made materials. Look what our fishing rod has reeled in: Crocs! The Beach Line boat shoe is a mighty fine catch, with its navy Croslite upper featuring deck shoe lacing and cut out detail for breathability. A non marking sole makes this the catch of the day. Wearing Crocs in the winter? Who would ever have thought it? The Winter Puff Boot features a hot pink CrosLite material upper with a snug man made shaft and collar. Pale pink accents and Crocs branding finish things off. 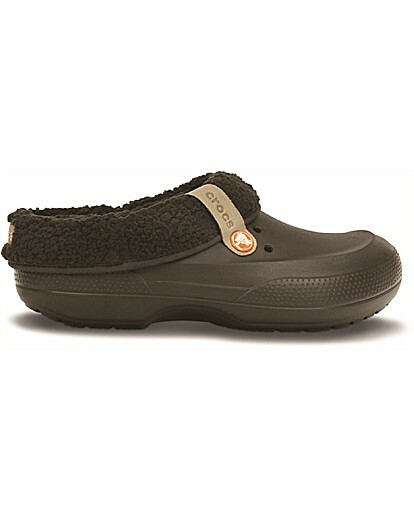 The Yukon Sport is a rugged Croc with unparallel comfort and more technology! An advanced ventilation system filters away everyday debris and water while a loose fit and touch fastening straps enable your feet to move freely. Little Crocs with Lego Blocks, the classic slip on is given a playful update with the help of every childs favourite toy. The iconic shoe features a colourful manmade upper which features lego blocks around the mid sole. Finished with Croc strap. The Crocband is perhaps the most iconic design from Crocs and its now here for toddlers. This super lightweight design is made with red Croslite material and features an orthopaedic footbed. Heel strap provides a secure fit. Who lives in a pineapple under the sea? SpongeBob SquarePants of course! Kids can soak up the sun with their favourite sponge and Crocs. The Clog is made with light weight Croslite and best pal Patrick makes an appearance on the right foot.